We at allsandwich have learned through experience you can’t always trust foods that are clearly one thing, but claim to taste like a different thing. And so we treated the box of S’mores Ice Cream Sandwiches that somehow found its way into our Trader Joe’s cart a couple of weeks ago with some skepticism. As it turned out, we had no need to. 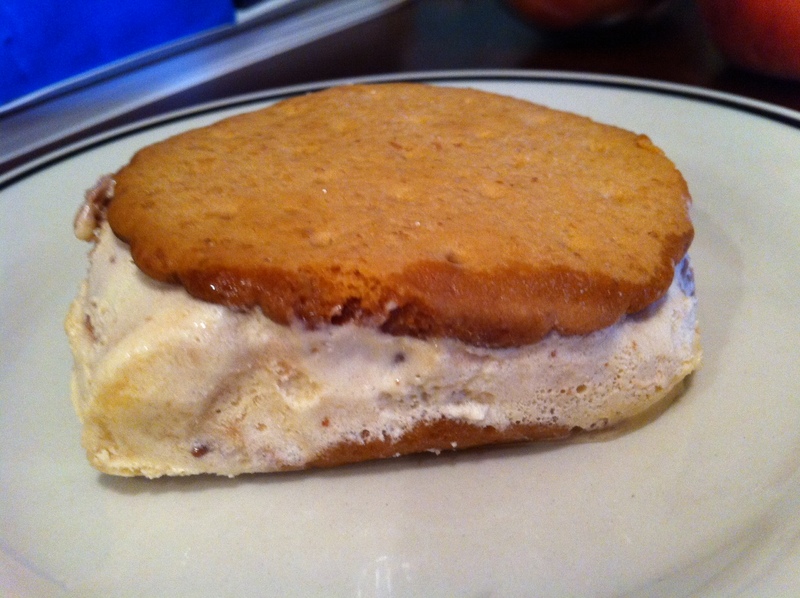 This is not a completely perfect ice cream sandwich. The cookie “bread,” made of graham cracker in this case (naturally), is just the tiniest bit too soft, leaving the sandwich without much textural variety. But for a store bought treat, the ice cream is divine. Fluffy and indeed somewhat marshmallowy in texture and flavor, it also has a nice light swirl of chocolate to complete the classic s’mores trifecta of delicious. By the way: we don’t usually review ice cream sandwiches here. But since allsandwich is located in Las Vegas, and it’s currently 147 degrees here (with the comfort index figured in) we’re going to go ahead and say, “Oh hell YES” to ice cream sandwiches.